Your Place in Spain offer fantastic Murcia golf opportunities on the most popular golf resorts,many of the golf courses are located close to one another, offering home owners and keen golfers a different playing, and social scene, option every day of the week. A Challenging 18 hole golf designed around apartments, townhouses & Villas. The resort is located 5 minutes from San Javier airport making it a great option for holiday rentals; it is also close to the beach and amenities. There is an excellent clubhouse restaurant and an on resort supermarket. Possibly now the flagship resort of the Polaris World project from 2003. This resort has developed from a 9 hole golf course with circa 750 properties surrounding it, into a popular, well-kept, and busy resort. Featuring an 18 hole golf course, and with a Phase 2 project now completed of apartments, townhouses & villas, there really are some great opportunities on this resort. A 5 star Intercontinental hotel, bars & restaurants, a large resort supermarket, paddle tennis courts, and of course its location. Being located just 7km from the beach and close to San Javier airport makes this resort a very popular choice for home buyers, whether relocating or renting. The largest 18 hole golf resort built by Polaris World, complimented by a 5 star hotel and a large on site supermarket. There are bars, restaurants, and tennis courts, and circa 1750 properties are on this resort, located approx 15 minutes from San Javier airport. A well kept course with one or two tricky holes, and only a 10 minute drive from the Mar Menor Golf resort. One of the longest golf courses in Spain, Hacienda Del Alamo is a challenging 18 hole monster. The resort is located inland from the Mar Menor coast yet almost next door to the soon to be operational airport at Corvera. This fantastic resort is expected to become a popular destination for buyers and holidaymakers alike. With great priced apartments and villas available, with a large club house and great facilities along with a tennis and golf academy. An apartment only golf resort located in the beautiful Murcian countryside, just 5 minutes from the La Torre Golf resort; make this 18 hole course a very desirable location. A great course to play, some would say the best of all the local courses. An established community, with a restaurant, clubhouse, & bars make this a must see resort with some great priced opportunities. A unique 18 hole golf course, with a desert style design offering fantastic views out to the Mar Menor and mountains close by. A choice of villas and apartments are offered for sale on this resort. The location is close to the new airport at Corvera, and only a 20 minute drive from the beautiful city of Murcia. The resort offers a clubhouse, restaurant, bar, supermarket, various swimming pools, and tennis courts. This is a great place to own a property. 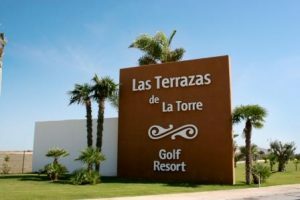 Located next door to the larger La Torre Golf Resort, an 18 hole welcoming course awaits players. This is the most recent of the Polaris style resorts. Whilst originally only apartments were built here, villas are now available, and built to order, in a modern Ibiza style. This is a gated resort, in a peaceful location, with beautiful gardens & communal pools, and easy access to airports and the coast. Paraleja Golf is situated inland from the Mar Menor coast, just a 20 minute drive to the local village of Sucina. This resort features a Seve Ballesteros designed 18 hole golf course. The course meanders through lakeland and countryside, making it the perfect location for an architect designed luxury villa. The on resort facilities include a fabulous clubhouse & restaurant, pony trekking, tennis courts and children’s play area. This resort is in a very unique location, with a beautiful property selection. This resort is located in the south west of Murcia, with the closest coast being at Mazzaron which is approximately 20 minutes away. It is also just 15 minutes from the new Covera Airport. This is a resort designed in a very different style to the other Polaris world resorts. An 18 hole golf course that is fair yet can be challenging, even to the low handicappers. The resort features a great town centre, restaurants & bars. There is a great choice of apartments here at fantastic prices. 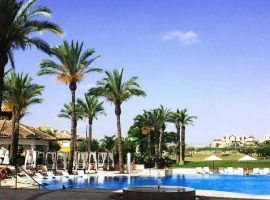 Whilst not located in the Murcia region this premier award winning golf resort offers a host of benefits for golfers and people looking for something a little different. It is located in Campoamor, only 15 minutes from the Murcia region. The Properties are of a modern design, with state of the art construction. The resort offers club house, restaurant & bar, tennis courts, gym, bike riding, and private beach club. A must see resort.